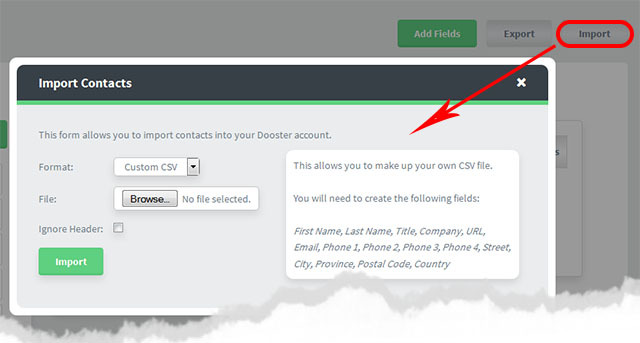 Dooster’s contact import feature allows you to import your existing contacts for use in your Dooster account. You can do this by exporting your existing contacts from your current database or application into a CSV file. You can do this from any contact manager such as Outlook, Thunderbird and so on. There are many guides to help you – please see below for more on this. Once you have this file ready, you can import it by going to Contacts, clicking on the Import button and selecting it in the appropriate file field. you have the correct number of fields (Don’t add any). if you leave the header fields in your CSV file then make sure to check the “Ignore Header:” option. Please note that the import mechanism will overwrite any existing contacts with the same name. Use the export button to quickly produce a CSV file. You can then upload this into any other software. For example here are some we quickly found: Exporting Your Outlook Contacts to a CSV File (more info) and How to Export Your Yahoo! Mail Address Book (see here). Simply Google what you need to know for any other contacts / address book software. You can use Google contacts to import your contacts to your Dooster account.